It was time to pack some more miles on the rental car and tour the east side of the island. We had our standard breakfast of fresh buns, cheese, chorizo paste, bananas, and I was trying to find the delicious grape jam that tio Manuel made, but I think he hid it on me because I’ve been eating too much of it. I popped the car into first gear and peeled away on a fine Saturday morning, which could have been a Monday for all I cared - they are all the same when on vacation. We drove east to Ponta Garca and just past there saw a sign pointing to a place we’d never head of called Praia Da Amora. We drove down a wickedly steep road, and then down a wickedly steeper road with a single lane, hoping nobody was going to be driving up. There was a small dirt parking lot, an ancient fountain with fresh water spilling out of it, and a trail leading down into the forest. We parked the car and started walking down, not knowing where it was going, but ready for a hike to start the day. The path was steep, but not vertical like the last one, and ended up close to the shoreline, but the path itself was starting to crumble and let go from the side of the cliff, so we didn’t push our luck and stopped there instead of trying to follow it all the way down. As usual, the way back up was a snap for the kiddies and slightly tougher for the parent figures. At the top, Magnus buried his head into the fountain and drank a bunch of the water straight from the tap, and only after asked me if I thought the water was safe to drink. “Great, do you want to drink some?” Magnus asked. We continued driving and came across a “Miradour” sign which means a lookout or viewpoint. At the top of the hill we found an intriguing building called Castelo Branco - White Castle, and it did indeed look like a small castle, quite different from all the other buildings we’ve seen here. The wind was howling at the top of the hill, so we stayed just long enough to climb the tower and take some pictures from atop of the structure. I scrubbed the internet trying to find out what this tower was used for but came up blank. There are many whale spotting towers scattered around the island, but these are usually much closer to the ocean than this one and have a very different look. I asked the cousins too and they didn’t know anything about it. The next part of the drive took us to the town of Povocao, probably both Ana and my favourite village on the island, and one which we’ve visited every time we’ve been to the Azores. Why is it so cool? The fully cobblestoned paths with amazing decorations build into the rock, the many restaurants, the free zoo, the marina, the river flowing out into the ocean, and the ancient monument in the middle of town inscribed with 1432 - the year of the discovery of the Azores. And all of this within a short walk of the middle of the town. 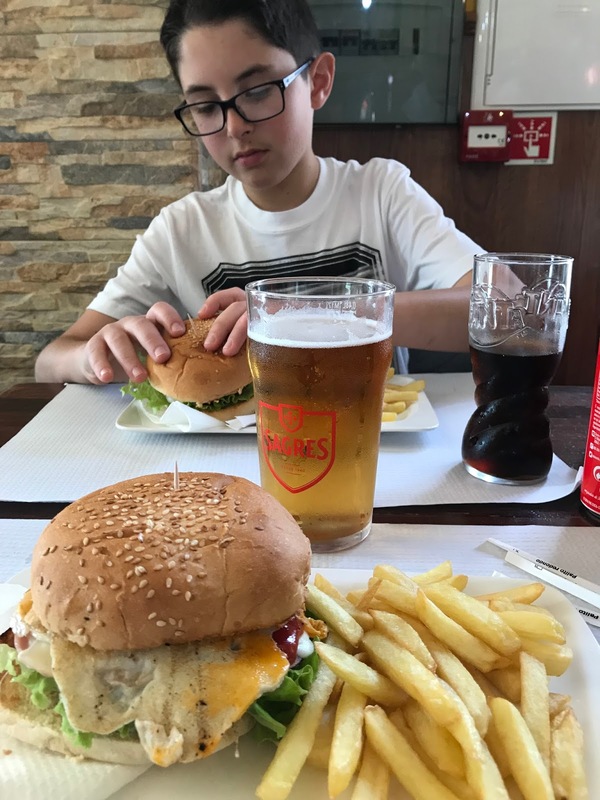 We stayed for lunch at one of the Snack Bars and had four full meals, two beers, drinks for the kids, coffee and dessert for 21 euros. What a deal. Furnas was our next stop, so we did some backtracking and then had to decide which hot spring to visit - Poca da Dona Beija (the one we were at last Sunday) or the ones at Terra Nostra Gardens. We chose to go back to the first one, basically because we had so much fun last week, we wanted one more swing at it. And although much busier than last week, it was great! After the spa we explored Furnas a bit more, finding an amazing viewpoint over the town, and going for a walk around Furnas lake, where there was an old, deserted church and botanical gardens. We drove back home and had a good visit with Natercia and Pedro and then went out to the Beach Bar and Grill near Sao Roque and overlooking the beach Praia das Milicias. We had another fantastic meal here and realized that this is our favourite restaurant on the island. The server looks a bit like Javier Bardem and seems to be running a one man show as he is the server, cleaner, bartender and chief of hospitality. I think there must be a cook buried in the back somewhere, but I didn’t see him or her. If you visit the Azores, you must check this place out.